The Center “Nasledie” after Pitirim Sorokin and the Department of History of Russia and Foreign Countries of the Institute of Humanitarian Sciences of the Syktyvkar State University announce the holding of the Republican contest “The life and creative work of P.A. Sorokin”. On August 17, the presentation of the publications prepared for the 90th anniversary of the Komi Republic took place in the Finno-Ugric Cultural Center. There were web-site"rksorokintz.org", multimedia disc “Pitirim Sorokin – an outstanding thinker of the XXth century”, the first issue of the journal “Nasledie” and the book by P. Krotov and A. Dolgov “From war to Peace. To the Origins of P.Sorokin's Creative Altruism”. 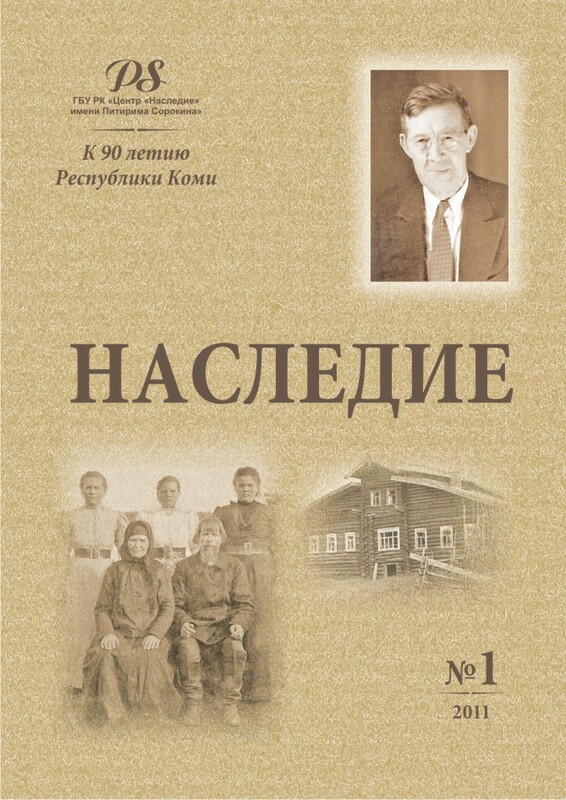 The first issue of the journal “Nasledie” was released on the 90th anniversary of the statehood of Komi. The grand opening of the Center “Nasledie” after Pitirim Sorokin was held on February 4 - the birthday of a world-famous sociologist, a native of the Komi Republic. The Center “Nasledie” after Pitirim Sorokin became the official partner of the project “The Name of the Finno-Ugric World” of the Information Center of Finno-Ugric Peoples FINUGOR.RU. The book was published: P.P. Krotov and A.Yu. Dolgov “From war to Peace. To the Origins of P.Sorokin's Creative Altruism”. On the portal finnougr.ru the interview with the Director of the Center “Nasledie” E.A. Saveleva was published.